Since the early days of my carnivorous life, I've been wishing for something like mayonnaise to eat with leaner meat. Heaven forbid I should end up with leftover chicken breast, because I cooked the whole beast and the wacko lean-eaters didn't finish it off, for example. I tried a few times to make mayonnaise with bacon fat, but my results were inconsistent. Sometimes it broke, and even when it didn't, it never turned out as delicious as one would think it should. Come on, it's bacon. It ought to be divine! Yet, it remained dissatisfying. 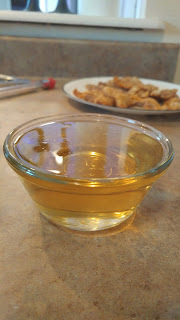 For one thing, I always found the vinegar or lemon juice to overpower the delicate taste. For another, because I hadn't yet learned to roast bacon in the oven, the nearly inevitable bits of burn flavour from the pan were somehow always accentuated in an unpleasant way. The bottom line was nobody, not even I, wanted to eat it. Once I discovered that I like to eat plain tallow, lard, or schmaltz on meat, or even just on a spoon, I more or less forgot about the idea, until recently, when I started wishing for it again. 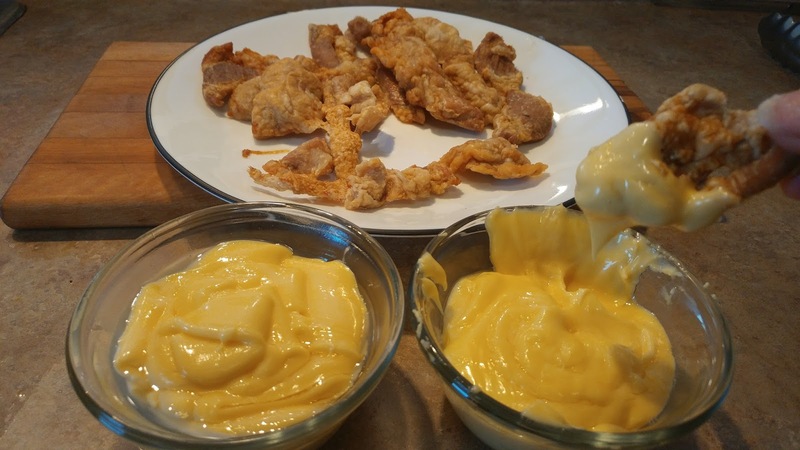 The first thing you have to deal with when making carnivorous mayonnaise is the fact that animal fat is not usually pourable at room temperature. So you have to melt it first. 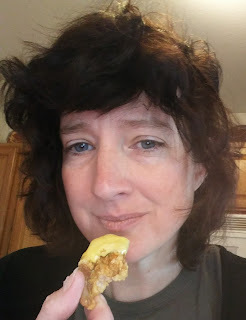 One day, I suddenly thought about hollandaise sauce, which is basically mayonnaise but made over heat with melted butter instead of oil. The gears began turning. 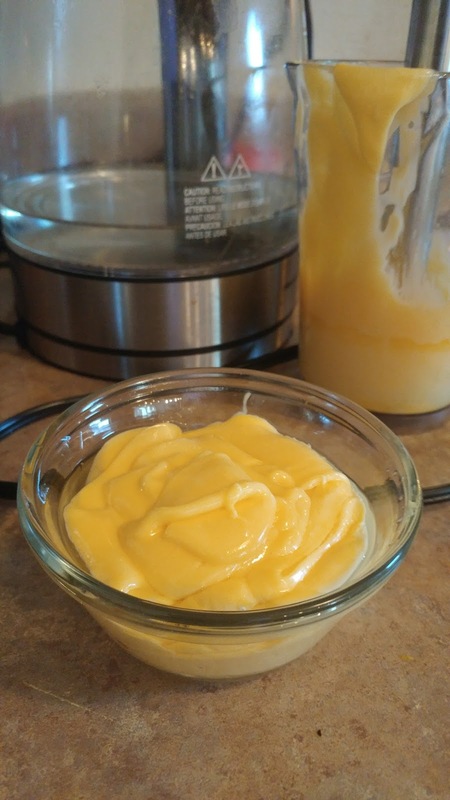 In mayonnaise, it is recommended that all the ingredients are at room temperature, but in hollandaise sauce we heat the yolks about as much as possible without actually cooking them. The reason they need to be warm is that the proteins in yolks are tightly folded, and heat allows them to unfold enough to be able to surround the fat droplets and emulsify them. If they unfold too much, they start binding with each other irreversibly, and you get scrambled eggs. 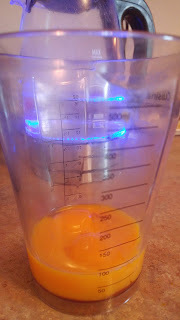 The reason for heating the yolks first, then, is that warmer yolks allow more emulsion, but you have to be careful. The reason for the addition of acid took me longer to discover. There are a lot of sites claiming it's to kill bacteria in the raw yolk. I don't really buy that. I doubt it would be effective and anyway I'm not really concerned about it. Others mentioned that it would add surface area to increase emulsion. While that's plausible, you could just as easily add water. I was more persuaded by people who admitted they were doing it simply for taste. That's a fine reason, if you are into it. However, according to Jacob Burton of Stella Culinary, the real reason is that yolks normally curdle somewhere between 71-76°C, but acid raises the curdling temperature to 90°C, which gives you more of a safety net. In my first experiments with bacon fat hollandaise, I didn't bother with acid, and I still prefer it without. However, I did break it a few times by pouring the fat straight from the oven. 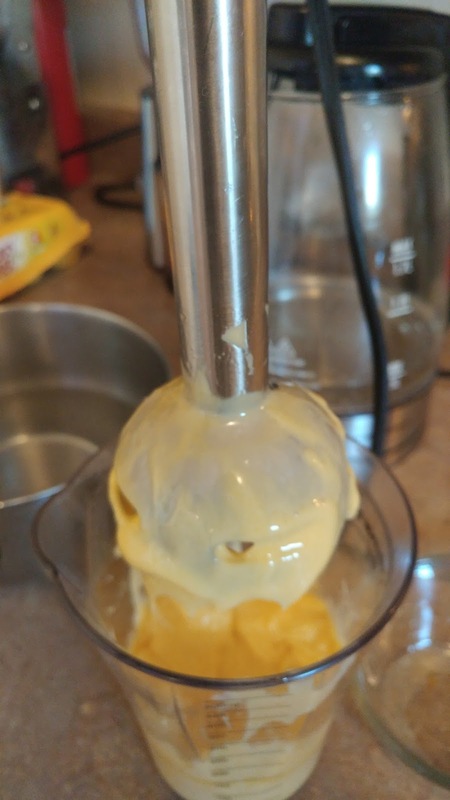 Now I know better, and I've finally found a use for my old candy thermometer, which is one of those tools from the bad old days that I've kept around for no prior reason other than that I'm a recovering hoarder. 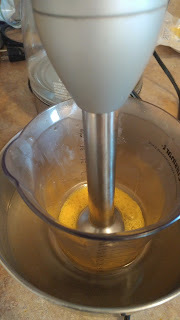 Here's what I do to make hollandaise from animal fat, in this case using pork fat I bought from the butcher for 99¢/lb. I've tried butter, tallow, and blends of the three. Next time I plan to try schmaltz. I rendered some of the fat by roasting for 20 minutes at 475°F (the pan was initially full, but it shrank). 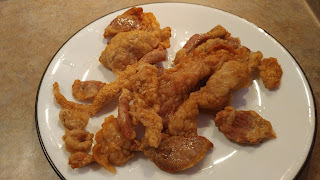 I took off the crispy pork pieces, and left the fat to cool for a while. Then I poured the liquid gold into a small bowl easier to pour from. I used an immersion blender to blend four yolks, with the blending cup itself immersed in a bowl of boiled water. 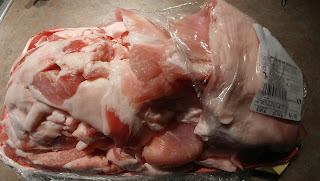 Then once they were as thick as they were going to get, I drizzled in all the pork fat, about 6oz. In a guest post I wrote for Break Nutrition today I showed that the RDA for vitamin C is grossly inflated, particularly on a ketogenic diet. The amount of vitamin C that prevents scurvy, even in carb-eaters, is at most a mere 10 mg a day, and there is little support for taking extra, unless your system is overloaded with glucose. It is known, but not widely acknowledged that fresh meat cures scurvy. This was discovered over a hundred years ago. I recently happened upon an issue of the Lancet from August, 1882, in which there was much debate: not about whether fresh meat cures scurvy, that was known, but rather about why fresh meat cures scurvy, but hung or dried meat does not. 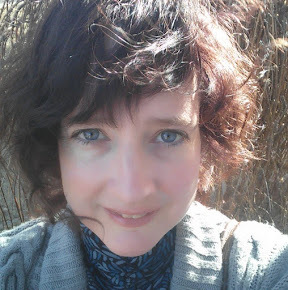 A few authors referred to previous work, and were I able to pursue the Writing Life more fully, I might take it upon myself to chronicle this discovery. For today I have just excerpted some of my favourite quotes which you can find below. Something I want to point out about these early conversations is that no one is specifying that they were using organ meats in particular, and there is no reason to believe they were. While it's true that liver, for example, is very high in vitamin C, the fact is that there is enough in plain old skeletal muscle meat to do the trick. If you go to the standard reference, the USDA database (or its proxy on self.com), it lists most meat flesh as containing no vitamin C at all. This is nonsensical. Not only does it contradict reports such as from the Lancet, but anywhere there is collagen, there is bound to be some vitamin C. I used to assume this was rounding error, and that the amounts were negligible, but that's not true. On further searching, I discovered that the practice of the USDA labs with respect to muscle meat of mammals is to fill in vitamin C as assumed to be zero! You can this documented in the USDA Nutrient Data Set for Retail Beef Cuts. Every micronutrient was measured directly, with the exception of vitamin C. It's egregious. They don't do this with fish or shellfish, or even organ meats, but I verified they do it with beef and pork, and presumably that's the practice with all the other meats listed at 0.0mg vitamin C.
I was only able to find one old report that lists some measurements of vitamin Cin various tissues of a few animals including some livestock. As you can see, the worst case scenario comes from a measurement of ox, which had 1.6mg/100g. It seems to me that the real value for beef is likely to be more, especially considering that sheep was reported here at nearly twice that. But even if we take that pessimistic value, it's clear that we can still get our antiscorbutic dose from 625g (less than 1.5 lbs) of beef. The bottom line is that even on a diet of just muscle meat, you should expect to get enough vitamin C.
The vitamin C present in meat, along with the vitamin C sparing effect of low carb diets is enough to prevent scurvy, even without going out of your way to eat liver or other organs. Save those for pleasure! Edited to Add: In conversation about this post, Esmée La Fleur pointed out to me that American beef is typically hung, but we are not seeing scurvy in the modern Zero Carb / Carnivore community (with the exception of two cases I've heard of where the people were eating exclusively pemmican for long periods). That includes Stefánsson. Michael Goldstein pointed out that Stefánsson's writings indicate that Inuit ate most meat well done. My hypothesis from these added points is that perhaps hanging and some cooking reduces vitamin C enough that for those still eating glucose, it's not enough to be antiscorbutic, but for carnivores it may be. I'd love to get accurate modern measurements. You can find this in Google books . "For the boat journey we saved 40 lb. of tinned meat (per man), and 351b. of tinned soups(per man), 3cwt. of biscuit, and about 800lb. of walrus me it, which was cooked and soldered up by our blacksmith in old provision tins. About 80 lb. of tea were saved, enabling us to have tea night and morning till almost the day we were picked up. No lime-juice was saved. A few bottles of wine and brandy were secured, and kept for Mr. Leigh-Smith and invalids. All the rum was saved, and every man was allowed one-fifth of a gill per day until May 1st, 1882, when it was decided to keep the remaining eighteen gallons for the boats. One man was a teetotaler from January to June, and was quite as healthy as anyone else. Personally it made very little difference whether I took the allowance of "grog" or not. One of the sick men was also a teetotaler nearly all the time. During the boat journey the men preferred their grog when doing any hard work, a fact I could never agree to, but when wet and cold a glass of grog before going to sleep seemed to give warmth to the body and helped to send one to sleep. Whilst sailing, also, one glass of grog would give temporary warmth ; but everyone acknowledged that a mug of hot tea was far better when it was fit weather to make a fire. I do not think that spirits or lime-juice is much use as anti scorbutics ; for if you live on the flesh of the country even, I believe, without vegetables, you will run very little risk of scurvy. There was not a sign of scurvy amongst us, not even an anaemic face. I have brought home a sample of bear and walrus meat in a tin, which I intend to have analysed if it is still in good preservation ; and then it will be a question as to how it will be best to preserve the meat of the country in such a form as to enable a sufficient supply to be taken on long sledge journeys ; for as long as you have plenty of ventilation and plenty of meat, anyone can live out an Arctic winter without fear of scurvy, even if they lie for days in their beds, as our men were compelled to do in the winter when the weather was too bad to go outside (there being no room inside for more than six or seven to be up at one time)." p331, John Lucas: "Sir, —A propos the annotation appearing under the above heading in The Lancet of June 24th, pp. 1048-9, I would beg permission to observe that almost every medical man in India will be able to endorse the views of Dr. Moore, to which you refer. Medical officers of native regiments notice almost daily in their hospital practice that—to use your writer's words—"insufficient diet will cause scurvy even if fresh vegetable material forms a part of the diet, though more rapidly if it is withheld." Indeed, so far as my humble experience as a regimental surgeon from observations on the same men goes, I am inclined to think that the meat-eating classes of our Sepoys—to wit, the Mahomedans, especially those from the Punjaub—are comparatively seldom seen with the scorbutic taint ; while, on the contrary, the subjects are, in the main, vegetable feeders who are their non-meat-eating comrades, the Hindus (Parboos from the North- West Provinces and Deccan Mahrattas), especially those whose daily food is barely sufficient either in quality or quantity. A sceptic may refuse to accept this view on the ostensible reason that though the food of the meat-eating classes be such, it may, perchance, contain vegetable ingredients as well as meat. To this I would submit the rejoinder that as a matter of fact, quite apart from all theory and hypothesis, the food of these meat-eating classes does not always contain much, or any, vegetables. In the case of the semi-savage hill tribes of Afghanistan and Baluchistan, their food contains large amounts of meat (mutton), and is altogether devoid of vegetables. The singular immunity from scurvy of these races has struck me as a remarkable physiological circumstance, which should make us pause before accepting the vegetable doctrine in relation to scurvy et hoc genus omne." p370 Charles Henry Ralphe "To the Editor of The Lancet. Sir, —I was struck by two independent observations which occurred in your columns last week with regard to the etiology of scurvy, both tending to controvert the generally received opinion that the exclusive cause of the disease is the prolonged and complete withdrawal of succulent vegetables from the dietary of those affected. Thus Mr. Neale, of the Eira Arctic Expedition, says : " I do not think that spirit or limejuice is of much use as an anti scorbutic ; for if you live on the flesh of the country, even, I believe, without vegetables, you will run very little risk of scurvy." Dr. Lucas writes: "In the case of the semi- savage hill tribes of Afghanistan and Beluchistan their food contains a large amount of meat, and is altogether devoid of vegetables. The singular immunity from scurvy of these races has struck me as a remarkable physiological circumstance, which should make us pause before accepting the vegetable doctrine in relation to scurvy." These observations do not stand alone. Arctic voyagers have long pointed out the antiscorbutic properties of fresh meat, and Baron Larrey, with regard to hot climates, arrived at the same conclusion in the Egyptian expedition under Bonaparte, at the end of last century." p495 "SCURVY. Dr. Buzzard, in a letter which appeared in oar columns last week, considers the fact that the crew of the Eira were supplied with preserved vegetables tells against the supposition advanced by Mr. Neale, that if Arctic voyagers were to feed only on the flesh of the animals supplied by the country they would be able to dispense with lime-juice. The truth is, it is an open question with many as to the relative antiscorbutic properties of preserved vegetables, and whether under the circumstances in which the Eira's crew were placed they would have been sufficient, in the absence of lime-juice and fresh meat, to have preserved the crew from scurvy. A case in point is the outbreak that occurred on board the Adventure, in the surveying voyages of that vessel and the Beagle. The Adventure had been anchored in Port Famine for several months, and although "pickles, cranberries, large quantities of wild celery, preserved meats and soups, had been abundantly supplied," still great difficulty had been experienced in obtaining fresh meat, and they were dependent on an intermittent supply from wild-fowl and a few shell-fish. Scurvy appeared early in July, fourteen cases, including the assistant-surgeon, being down with it. At the end of July fresh meat was obtained; at first it seemed to prove ineffectual, but an ample supply being continued, the commander was able to report, by the end of August, " the timely supply of guanaco meat had certainly checked the scurvy." This is an instance in which articles of diet having recognised antiscorbutic properties proved insufficient, in the absence of lime-juice and fresh meat, and under conditions of exceptional hardship, exposure, and depressing influence, to prevent the occurrence of scurvy. So with the Eira, we believe that had they not fortunately been able to obtain abundant supplies of fresh meat, scurvy would have appeared, and that the preserved vegetables in the absence of lime-juice would have proved insufficient as antiscorbutics. This antiscorbutic virtue of fresh meat has long been recognised by Arctic explorers, and, strangely, their experience in this respect is quite at variance with ours in Europe. It has been sought to explain the immunity from the disease of the Esquimaux, who live almost exclusively on seal and walrus flesh daring the winter months, by maintaining that the protection is derived from the herbage extracted from the stomach of reindeer they may kill. In view, however, of the small proportion of vegetable matter that would be thus obtained for each member of the tribe, and the intermittent nature of the supply, it can hardly be maintained that the antiscorbutic supplied in this way is sufficient unless there are other conditions tending in the same direction. And of these, one, as we have already stated, consists probably in the fact that the flesh is eaten without lactic acid decomposition having taken place, owing either to its being devoured immediately, or from its becoming frozen. The converse being the case in Europe, where meat is hung some time after rigor mortis has passed off, and lactic acid develops to a considerable extent. This seems a rational explanation, and it reconciles the discrepancy of opinion that exists between European and Arctic observers with regard to meat as an antiscorbutic. In bringing forward the claims of the flesh of recently killed animals as an antiscorbutic, it must be understood that we fully uphold the doctrine that the exclusive cause of scurvy is due to the insufficient supply of fresh vegetable food, and that it can be only completely cured by their administration ; but if the claims advanced with regard to the antiscorbutic qualities of recently slaughtered flesh be proved, then we have ascertained a fact which ought to be of the greatest practical value with regard to the conduct of exploring expeditions, and every effort should be made to obtain it. Everything, moreover, conducive to the improvement of the sailor's dietary ought to receive serious consideration, and it has therefore seemed to us that the remarks of Mr. Neale and Dr. Lucas are especially worthy of attention, whilst we think the suggestion of the former gentleman with regard to the use of the blood of slaughtered animals likely to prove of special value." p913 "Sir, —In a foot-note to page 49G of his " Manual of Practical Hygiene,", fifth edition, (London, Churchill, 1878), Parkes says : —"For a good deal of evidence up to 1818, I beg to refer to a review I contributed on scurvy in the British and Foreign. Medico-Chirurgical Review in that year. The evidence since this period has added, I believe, little to our knowledge, except to show that the preservation and curative powers of fresh meat in large quantities, and especially raw meat (Kane's Arctic Expedition), will not only prevent, but will cure scurvy. Kane found the raw meat of the walrus a certain cure. For the most recent evidence and much valuable information, see the Report of the Admiralty Committee on the Scurvy which occurred in the Arctic Expedition of 1875-76 (Blue Hook, 1877)." I think that the last sentence in the above is not Parkes' own, but that it must have been added by the editor in order to bring it up to the date of the issue of the current edition. The experience since then of the Arctic Expedition in the Eira coincides with these. I refer to that portion of the report where the author tells us that "our food consisted chiefly of War and walrus meat, mixing some of the bear's blood with the soup when possible." And again: "I do not think that, spirits or lime-juice is much use as an antiscorbutic, for if you live on the flesh of the country, even, I believe, without vegetables, you will run very little risk of scurvy. There was not a sign of scurvy amongst us, not even an anaemic face," (Lancet, Aug. 26th.) So that, as far as this question of fresh meat and raw meat and their prophylactic and curative properties are concerned, ample evidence will be found in other published literature to corroborate that of the Eira. But when you take up the question of the particular change which takes place in meat from its fresh to its stale condition, you will find a great deal of diversity and little harmony at opinion. Without taking up other authors on the subject, we stick to Parkes and compare his with Pr. I ; life'.-, views on this point. Parkes thought "fresh, and especially raw meat, is also useful, and this is conjectured to be from its amount of lactic acid ; but this is uncertain,"1 while on the other hand Dr. Ralfe repeats, as a probable explanation, too, of the reason of fresh meat being an anti scorbutic, but that it is due to the absence of lactic acid. For, from well-known chemical facts he deduces the following: — " In hot climates meat has to be eaten so freshly killed that no lime is allowed for the development of the lactic acid : in arctic regions the freezing arrests its formation. The muscle plasma, therefore, remains alkaline. In Europe the meat is invariably hung, lactic acid is developed freely, and the muscle plasma is consequently acid. 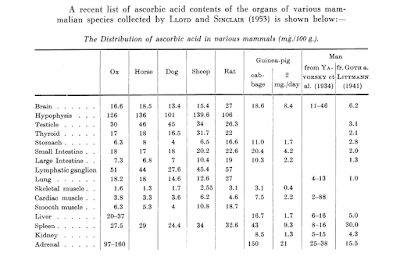 If, therefore, scurvy is, as I have endeavoured to show ("Inquiry into the General Pathology of Scurvy"), due to diminished alkalinity of the blood, it can be easily understood that meat may be antiscorbutic when fresh killed, or frozen immediately after killing, but scorbutic when these alkaline salts have been converted into acid ones by lactic acid decomposition. '"-' The view of the alkalinity of the blood coincides with Dr. Garrod's theory, which, however, appears to have as a sine qua turn the absence of a particular salt- namely, potash. I am inclined to think that, taking into account the nervous symptoms which are not infrequently associated with a certain proportion of scorbutic cases, resulting probably from the changes taking place in the blood, not unlike those which occur in gout and rheumatism, there must be some material change produced in the sympathetic system. In many of the individuals tainted with scurvy there were slight and severe attacks of passing jaundice in the cases which occurred in Afghanistan. Can we possibly trace this icteric condition to this cause? This is but a conjecture so far. But there certainly is in Garrod's observations an important point which, if applicable to all countries, climates, and conditions of life, is sufficiently weighty to indicate the necessity for farther research in that direction, and that point is this : the scorbutic condition disappeared on the patient being given a few grains of potash, though kept strictly on precisely the same diet which produced scurvy. —I am, Sir, yours truly, Ahmedabad, India, 30th Sept., 1882. JOHN C. LUCAS." Note: I have taken the liberty to change just a couple of unimportant words in these passages to serve as a watermark. Why? Because I have taken much pain to chronicle this. With other passages in the past, I have sometimes even had to write them out by hand, only to find them copied and pasted into other people's blogs on the topic with absolutely no attribution, as if they conceived the whole topic and did the research themselves. Please, if you find my work useful, cite me!